I was intrigued by the idea of a novel about Edwardian lady mountaineers, and I was even more intrigued when I placed the name of the author. 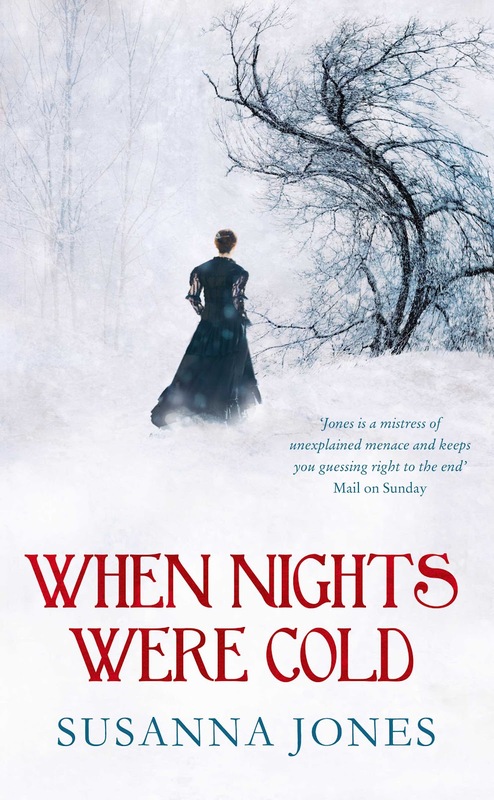 Because I recalled that Susanna Jones specialises in dark storytelling, unreliable narrators, and psychological drama. I hoped that When Nights Were Cold would be something rather special, and it very nearly was. When Grace Farringdon was growing up, she and her father followed the polar explorations of Ernest Shackleton and his contemporaries, studying every detail they could find. It was only supposed to be a diversion for a little girl; Grace and her sister were expected to grow up into obedient women who would look after their parents and find good, respectable husbands. They both wanted more, and their parents tried to clip their wings. They succeeded with Catherine, but not with Grace. She escaped, after using covert means to secure a place at an all-women college. It was wonderful to watch, and my heart rose for Grace and fell for Catherine. There’s a fine line between realism and pastiche, and another between drama and melodrama. Susanna Jones walks both rather well. It was wonderful to arrive at university with Grace. What a wonderful world it was: a world full of women seeking knowledge that no man may enter; a world where women were freed from social conventions, and addressed only by their surnames; a world of cocoa evenings, social clubs, new friendships, and so many wonderful possibilities. Grace was inspired and, full of confidence, she formed forms the Antarctic Exploration Society to follow, and maybe even to emulate, their adventures. Three other women joined Grace’s new venture: Leonora Locke, the confident and sociable daughter of liberal parents who wants to experience everything college can offer before she steps out into the world; Winifred Hooper, who is apprehensive about possible adventures, but curious and unwilling to be left out of any adventures that might present themselves before she settles into the traditional roles of wife and mother; and Cecily Parr, who is clever, forthright, knowledgable, and eager to take the lead. A diverse quartet indeed, and that confirmed the idea I had that all of this was a little bit contrived. But the relationships between the four had a very interesting dynamic and the story had so many possibilities. There would be adventures, there would be tragedies, and there would be repercussions. It was compulsive reading! In the end Grace would be the only survivor, living alone in the family home that she had hated. The stories of her friends, of her family, of just how she got there are complex, and quite extraordinary. And as those stories unfolded I began to question Grace’s sanity, and to question just how reliable her account of her life really was. She was a wonderfully storyteller, catching the dark atmosphere of her home, the cold intensity of her adventures, the tangled relationships that surrounded her, so very, very well. The story became more and more intense, more dark and claustrophobic, before winding up with a wonderful twist. I loved it, but still I have to quibble a little. Early in the story I loved the way Susanna Jones pitched her story between realism and pastiche, and between drama and melodrama. But later I began to wish that she would take her story one way or the other, and embrace that direction wholeheartedly. And I wish some of her ideas had been developed a little more, and some of the story opened out a little more. She had four women, undergraduates, with opposing views on women’s suffrage and I wanted to hear them argue, but I didn’t. I wanted to spend more time with the Antarctic Exploration Society, to follow every detail of their activities. It isn’t that this wasn’t a really good book – it was – it’s just that I have a feeling that it could have been just a little deeper and richer. The story itself is intriguing – it could have been more fleshed out as it were specially as you say on the women’s issues as the book primarily is about women. I would like to read this as I my interest has been piqued by so many of Cynthia Harrod Eagles books set in the late and mid 19th century dealt with these issues so well.